"Bamberg, Germany - The Old Rathaus" by Paul McGehee. A moonlit view of the "Altes Rathaus", the old Town Hall of the picturesque town of Bamberg, Germany. It is one of the most unique municipal buildings in the world in that it was constructed in the middle of a river, joined to land by two bridges. Bamberg, the city of seven hills, was at one time considered the center of the Holy Roman Empire and was ruled by a series of prince-like Bishops. Legend has it that, in the 1400s, the Bishop of Bamberg refused to grant the people of Bamberg any land upon which to build themselves a new Town Hall, which they felt they had great need for as the old one had burned. Blood was shed over this issue between troops representing the Mayor of Bamberg and the ruling Bishop. The Bishop ruled that no new Town Hall could be built upon land. Not to be outdone by this proclamation, the people of Bamberg defiantly set about building an artificial island in the middle of the swiftly-flowing Regnitz River, and over some time constructed a magnificent building upon it, completed in 1467. The beautiful Rathaus is covered in frescoes, carvings, and fachwerk, the half-timbering typical of the day. It stands today as one of the major tourist attractions of Europe...within its walls is housed one of the finest collections of art and Meissen porcelain in the world. 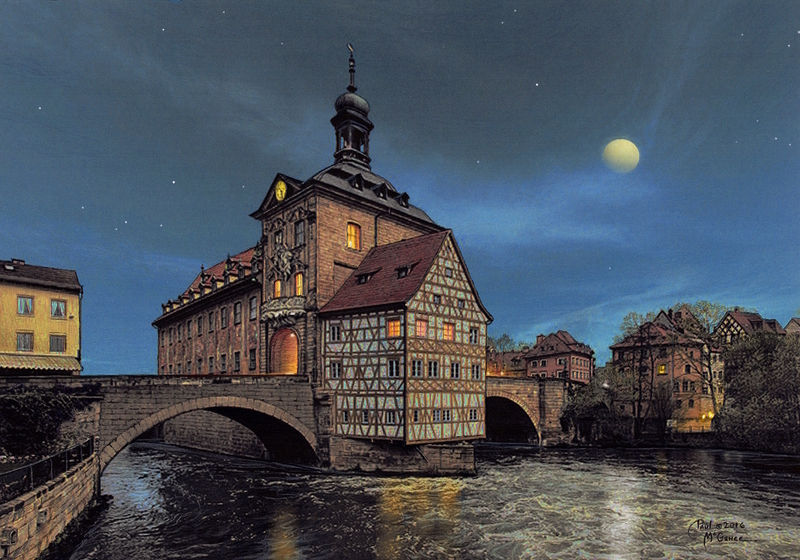 "Bamberg, Germany - The Old Rathaus" is faithfully reproduced from Paul's original color pencil drawing as an archival quality print issued in a strictly limited edition of only 500 pieces each hand-signed by the artist. 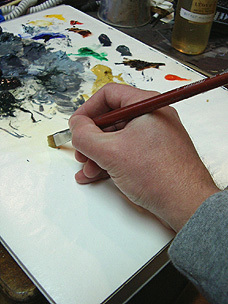 Image size 10 7/8" x 15 1/2".